The latest entry in the Super Smash Bros. series delivers on its promise that everyone is here and brings an amazing amount of content to its devoted fan base. Director Masahiro Sakurai brings out all the stops and gives longtime fans and newcomers alike an exciting party fighter that’s already solidified itself as a must have for Nintendo Switch owners. The Ultimate in the title wasn’t misleading; this is the Ultimate version of Smash. The Super Smash Bros. series lives and dies by its wide array of unique fighters brought in from all corners of the gaming universe to punch, kick, and, well, smash each other until one character is left standing. Ultimate offers the most characters ever offered in the series before with a whopping 77 characters (counting the now available Piranha Plant DLC). The catch is that you start the game with only 8 characters and will eventually unlock all the others through playing the game. In the past, on the Nintendo 64 original and Gamecube counterpart Melee, the Smash series primarily consisted of first party Nintendo characters such as Mario, Yoshi, and Pikachu. However recently, Smash has garnered more and more third party characters into the fray with the likes of Cloud from Final Fantasy VII, Ryu from the Street Fighter series, and even the return of Solid Snake from Metal Gear Solid complete with the original voice actor, David Hayter! With the addition of these third party characters it feels like Smash has the means to transcend company lines and offer up an experience that’s not just for Nintendo fans but for fans of gaming culture in general. If you’ve played video games over the last 40 years, there’s something in this game that you’ll recognize and smile about. Like past Smash Bros. titles, Ultimate offers many different modes and ways to play. Of course Smash is best played with friends sitting next to you that you can trash talk with or laugh at the downright ridiculous scenarios that happen in nearly every match. But I’m also pleased to report that it delivers a staggering amount of single player content for those of you who live very far away from your friend group (like me) so you can’t have couch parties so often. First off, it introduces a new mode called “Spirits.” Here you’ll find the closest thing to Super Smash Bros. Brawl’s Subspace Emissary story mode. Although it lacks the beautifully rendered cutscenes that stood out in Brawl, it more than makes up for it with raw amount of gameplay content. I spent a good 30 or so hours perfect clearing the story mode of “World of Light” and I was definitely pleased with the challenge. World of Light revolves around an evil entity, Galleom, who steals the spirits of all the Smash characters, leaving Kirby as the lone survivor to defeat Galleom and rescue the other fighters. The mode has you wander along a map to defeat fighters inhabited with other spirits from all over the gaming universe and capturing the spirits for your collection in order to equip to your fighter. Equipping spirits gives your fighter a boost to their stats and can also make you start battle with odd conditions. This is where The World of Light excelled with its clever use of spirits equipped to particular fighters such as equipping Ness with the Starman spirit for a boost to his PSI powers. Winning certain battles will also unlock a fighter that will join you on your quest to take down Galleom. Unlocking a fighter in World of Light also makes them available in other play modes so it’s an easy way to unlock all the characters if you’re playing on your own. Overall the story wasn’t actually much of a story. Don’t expect any cut scenes or anything along the likes of Subspace Emissary. The spirit battles are fun and some of them definitely made me use different strategies than in a normal battle but it does seem like a bit of a grind after a while. A lot of the spirit battles are fun but at times there were a few that just seemed downright unfair and I only won because of luck. This mode does offer a lot of challenges, especially to veterans of the series, but it shouldn’t be the main reason you purchase the game. Classic mode makes its return to the series better than ever with every character path well thought out and delightfully fun. I had a great time running through Classic Mode with around 30 or so characters to see all the different paths. It was great that some fighter’s final bosses weren’t just Master Hand but bosses from other games! My favorite was playing through Luigi’s Classic path and fighting Dracula from the Castlevania series; a callback to the trailer that introduced Simon and Richter Belmont where Luigi is in Dracula’s castle. Little things like that go a long way and show that the team really thought of special ways of how these characters would interact with each other. Smash is known for its chaotic multiplayer and it gets it right in so many ways this time around. There are so many options to customize your matches so that no two fights are alike. Smash is all about hitting the other fighters until they accumulate enough damage so they go flying off the stage. This simple gameplay has endeared since the original and the basic premise is still there. Now up to 8 players can fight on a single stage until the last man is standing, along with all sorts of items and unique stages from all the represented gaming franchises wrecking your day. Sometimes it’s difficult to comprehend what’s going on but that’s what makes Smash, Smash. One of the new multiplayer modes introduced in Ultimate is Squad Strike. Here, you can choose either 3 or 5 fighters per team. When one fighter falls, the next in line spawns in their place. It’s like playing stock but with a new fighter for every life. This allows for team based fighting with friends or a new way to play between two rivals. My friends and I enjoyed this one a lot because it allowed a lot of variation in strategies and thinking of what characters paired up and matched well together. Ultimate’s online can be a bit of a bust. I’ve played over a hundred online matches now ranging from 1v1, no items, Final Destination to 4-player anything goes and it can go either way. You can have matches that play perfectly fine with little to no lag but then have others where all the characters are frozen in place for 30 seconds. It can be frustrating to say the least. Playing online with friends is fairly simple, however, but comes with its share of hiccups. Simply create an arena that your friends can join and anyone in your friend list can join the fight. The arena allows for customization of matches and those not playing can watch the action on the sidelines. One major annoyance I found was that two people playing on the same console cannot join in the arena. This wouldn’t be a big deal if it weren’t for the fact that two players can play online co-op through quick matches. So if you have a friend over at your house and you’re looking to Smash with two other friends online, there’s really no way to set that up. Is was a bit of a letdown. Super Smash Bros. Ultimate looks and sounds amazing. It’s the best looking Smash game to date. The graphics look to be better than Super Smash Bros for Wii U with subtle differences to character models and stages. The team really worked hard to make this game look original and not just an enhanced port of the previous installment. The music is fantastic as well. There’s over 800 songs to collect and listen to within the game. This selection is robust for most franchises but I felt some major franchises were lacking. The Final Fantasy series is known for its amazing music but I was sad to see there’s only two tracks included here. But considering the amount of music available for other gaming franchises this is a nitpicky thing for me. Overall Super Smash Bros. Ultimate delivers with loads of fun, intense battles, and a distinct Nintendo charm that’s sure to win over the hearts of returning veterans and newcomers to series. There’s plenty of content to sink your teeth into to keep you smashing for years to come. Although there’s a few mistakes like lag in online battles there’s so much heart put into the game that it’s easy to overlook. There’s an insane amount of content that will keep you occupied long after you unlock every character. Anyone with a Nintendo Switch should own this game. Super Smash Bros. 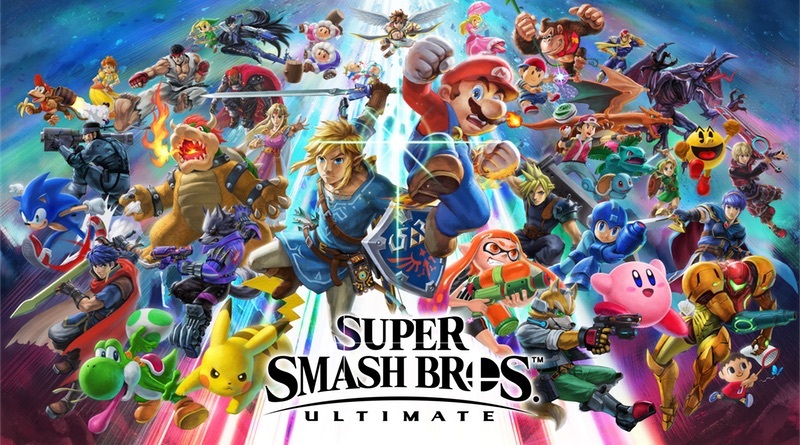 Ultimate delivers the definitive version of Nintendo’s popular party fighter with more characters, stages, and ways to play than ever before. Ultimate is a collection of gaming history from the last few decades with something for everyone. Every Switch owner should have this in their collection.